(1) Yes, It’s Time to Start Organizing for a Labor-Based Political Party! The adoption of these two resolutions followed an open forum the night before – attended by 50 convention delegates — titled, “Is It Time for a Labor-Based Political Party?” The forum was hosted by the American Postal Workers Union and the Amalgamated Transit Union. Forum speakers were Mark Dimondstein, president of APWU; Baldemar Velasquez, president of the Farm Labor Organizing Committee; Donna Dewitt, past president of the South Carolina AFL-CIO; and Mark Dudzic, national organizer of the Labor Committee for Single Payer. All agreed that, yes, we need to form a new labor-based political party. Brother Velasquez and Sister Dewitt proposed that pro-Labor Party union members could get the ball rolling today by participating in electoral politics with independent labor-community slates, but starting at the local and state levels. Advocates of independent working class political action need to seize this opening and run with it. Bolstered by the formation earlier this year of a new political formation — the Movement for a People’s Party (MPP) — we believe the time is now to take some next steps toward this objective. Advocates of independent working class political action need to seize the opening provided by the October 2017 resolutions adopted by the AFL-CIO national convention. What are some proposed next steps? (1) Begin the formation a Labor Party Advocates-type committee in the labor movement. Labor organizer Mark Dudzic told the forum at the AFL-CIO convention in St. Louis that, “building a new Labor-based party will be a long-range project and needs both community and labor support.” Okay, but it needs to start somewhere, and the time to get the ball rolling is now. These are proposals that we submit for discussion and consideration to you, our subscribers to The Organizer, and to the other unionists and activists who have supported our campaigns over the years. They are proposals that we submit respectfully to our friends in the MPP. Please let us know what you think. We are opening the pages of our Unity & Independence section to this discussion. We need to hear from you. An encouraging and potentially ground-breaking development has just taken place with the launching in early November of the Movement for a People’s Party (MPP). It was formed by “Draft Bernie for a New People’s Party,” and has the support of Cornel West and National Nurses United President RoseAnn DeMoro, among other prominent unionists and activists. “Draft Bernie” was founded last February by Nick Brana, who was Bernie Sanders’ presidential campaign outreach coordinator, and by tens of thousands of Bernie staffers and supporters who, having felt betrayed by the Democratic Party, which they accuse (correctly) of rigging the Democratic primary in 2016, reached the conclusion that Bernie and his supporters must break with the Democrats and form their own independent mass political party. And now, no longer willing to wait for Bernie to break with the Democrats, they have gone ahead to launch this new Movement for a People’s Party. “When ‘Draft Bernie’ was founded, few progressives were talking about starting a new party. In just a few months, ‘Draft Bernie’ has flipped the script, and the idea of building a people’s party has gone viral. Senator Sanders holds out hope that the Democratic Party can be reformed, but the American people have made their preference clear: The electorate is fed up with both establishment parties and desperate for a political alternative. “Public anger and frustration has reached a boiling point, and neither major party is giving voice to policies that would alleviate the hardship that working people face. Last year, voters in both major parties tried to nominate presidential candidates who weren’t truly members of their party before the election. They succeeded on the right and were blocked on the left. “A new party that supports free public college, universal health care, a living wage, higher taxes on the wealthy, getting big money out of our elections, and much of Sanders’ 2016 platform, will give Americans a party to vote for and inspire millions back to the polls. “The major parties are crumbling. The question is not whether there will be a new party in America. The question is what will the new party stand for and who will offer the country the alternative it so desperately craves? Will it be a right- wing populist party, the kind that Trump, Bannon and Mercer foreshadow? A new neoliberal party masquerading as third way, the kind that French elites used with [current French President Emmanuel] Macron? This all true and good. Yes, the establishment parties — like all the political institutions in this country — are in deep political crisis, reflecting the more fundamental crisis of global capitalism. Growing numbers of people feel disaffected, disenfranchised, left out — and there’s a reason for this: The Democratic Party and the Republican Party are both run, financed, and controlled by Wall Street and its cronies. And, yes, there is a political void that will be filled by the far right — as it did already in the 2016 presidential election with Trump — if an alternative that responds to the needs and aspirations of the working-class majority and all the oppressed does not come forward. But this raises the question of what kind of party is needed, and how do we get there from here. One lesson from the past is that we need a party that makes a clean break with the Democrats and challenges for political power — not a third party that functions mainly as a pressure group on the Democratic Party. And there is reason for concern on this score in the approach taken so far by the MPP. agreement. “Yes, the best way to reform the Democratic Party is to form a third party,” he said. Brana did not disagree. When Brana went on to list the political formations that he is now targeting to join the “coalition of progressive groups” for the MPP, one cannot help but notice that many of the major organizations mentioned (Our Revolution, DSA, Working Families Party) are “inside-outside” — in fact, mainly “inside” — parties. The issue of making a “clean break” with the Democratic Party cannot be dodged. It needs to be discussed and confronted head-on if there is to be any real motion toward building a truly independent political party of the working-class majority. In his interview with Jimmy Dore, Brana noted, correctly, that the quest to build mass, anti-establishment independent parties is an international phenomenon, not just a national one. But he then pointed to three “examples of success” in forging “coalitions of progressive groups” — Syriza in Greece, Podemos in Spain, and France Unbowed in France — that are not at all examples of independent politics. All three political formations erupted onto the political scene overnight with support of the youth and the unemployed who were sick and tired of being misled by the ruling Socialist parties and the main trade union federations linked to them. Millions of people turned to these parties for solutions, but the three formations cited by Brana have turned their backs on their base, and on the working class as a whole, as they implement all or parts of the ruling-class austerity plans. Podemos has turned its back on the struggle of the Catalan people for self- determination and independence, bending to the pressure of the ruling Socialist Party and the institutions inherited from the Francoist regime. It has conflated the trade unions with their misleaders, and thrown the organized working class and its organizations under the bus. And France Unbowed has jettisoned the very concept of the working class as it moves more and more toward a “populism” that gives the green light to many of Macron’s anti-working class directives. What all three formations have in common is that they are not rooted in the working class and its organizations. And as such, they all have bowed, to one degree or another, to the dictates of the European Union — that is, to the dictates of global capitalism. We could not agree more fully. But the Labor Party – and the organized working class — cannot be just one more component of a “people’s party.” What is needed is a working class party rooted in the unions and the communities of the oppressed, a party that is linked, moreover, to the struggle of the Black liberation movement to forge its own independent Black working class political party. Labor cannot be just one more player. It must be a major converging force. The task now, therefore, is to get the Labor Party discussion going inside the labor movement. It is a burning necessity. Alan Benjamin: When you launched the Movement for a People’s Party in November 2017, you stated that, “there is no path to power in the Democratic Party.” Since then the Unity Reform Commission of the Democratic National Committee (DNC) has met and tried to work things out so that the progressives can feel there is a reason for them to stick with the Democratic Party. What are your thoughts on the changes that the DNC’s commission has proposed? Nick Brana: The changes don’t even begin to scratch the surface. They don’t get at the nature of the Democratic Party, which, as one of the two establishment parties, is outside the influence of working people. Like the Republican Party, it is run and controlled by corporations, lobbyists, and big donors. The DNC’s Unity Reform Commission doesn’t address the issue of money in politics, of buying politicians. The idea that you can change a corporate party without challenging the levers of power held by the oligarchs is ludicrous. Take the DNC itself. It is supposed to keep the party accountable to its own rules. But it violated them in the party’s primaries in 2016. The whole process was entirely rigged. Bernie Sanders’ Our Revolution recently admitted this is an email sent out to their support base. They wrote that if the DNC did not make any significant changes — such as a substantial reduction of super-delegates, an ombudsman, financial transparency, and more — then there is nothing preventing the party from rigging the process again. And that is exactly what we’re heading to. The progressive movement should not be upholding this illegitimate “reform” process. Colorado and other states the Democrats are promoting laws to deregulate the banks and financial institutions. In state after state, the Democrats have been complicit in the drive to privatize public education, through their support of for-profit and private charter schools. The list goes on and on. The Democrats are one of the twin parties of the bosses, and that won’t change. Your comments? N.B. : Something that was better understood in 2016 after the election — something that the Democratic Party and the corporate media are trying furiously to erase — is that Trump is the symptom; Trump is not the root cause of our society’s problems. It was the very conditions created by the Democrats that put Trump in power. The Democrats’ failure to represent working people over many decades is the root cause of why we have Trump and the swing to the right. It’s a paradoxical situation. At the same time that you see Trump coming to power, with the resurgence of the far right, you’re also seeing polls that show that the American people are overwhelmingly and increasingly progressive on the issues: two-thirds support Medicare For All, two-thirds support free public college; nine-tenths support getting money out of politics — and you can go down the line. But the point is that the donors who fund both establishment parties are only threatened by the progressive wing, and so they are going to block any progressive who tries to come to power inside the Democratic Party. They’re going to do it again in 2020. A realization that I came to after working on the Bernie campaign and Our Revolution is that the Democratic Party internally is too undemocratic to be taken over. That is why we in the Movement for a People’s Party are building a movement across the country for a major new party that is genuinely progressive, that is internally democratic – with elected leaders who are accountable and can be recalled – and with a platform that is democratically formulated. This is impossible in either party of the billionaires. A.B. : In the early 1990s, an important section of the labor movement (representing more than 2 million union members) formed Labor Party Advocates. Its mission was to open a discussion in the labor movement about the need for labor to break with the Democratic Party. Many of us in LPA noted that without labor’s funds, phone-banking, and active GOTV door-to- door campaigning, the Democrats couldn’t get a dog-catcher elected, something that is still largely true today. candidates for public office, we would become “spoilers” — that is, we would take votes away from the Democrats and help the Republicans. Succumbing to this pressure, the Labor Party, which was founded in June 1996, voted at its three national conventions NOT to run its own labor candidates for public office. It became little more than a pressure group on the Democrats. Many of us drew the conclusion that to get the Labor Party ball rolling once again — after it was put on hold after the 2002 convention — you would have to begin at the local level running independent labor-community candidates, with union locals at the center. The stakes at the local level would be lower, and you could then build up your base and momentum to begin challenging the Democrats and Republicans for higher offices. This would create the momentum for a new party based on the unions and the communities of the oppressed. I should add here, speaking now as The Organizer newspaper, that we don’t particularly like the concept of a “people’s party” — which denotes a cross- class political formation. Such parties throughout our history have not been rooted in the working class and its organizations. They have seen themselves as representatives of all the people, whatever their social class, in opposition to the top oligarchs — but not in opposition to the capitalist class as a whole. What are your thoughts on these points; what should be the class nature of a major new party? And how do we get there from here; how do we move forward to the creation of a major new political party? N.B. : First, as you have said, labor’s relationship to the Democratic Party has devastated the unions, which are down from 35% to 11% of unionization in the country. The folks who began the Labor Party in the 1990s had reached the conclusion that the Democrats were not sufficiently different from the Republicans, and it was time to build independent working-class political power. But when you launched the Labor Party in 1996, you were ahead of the curve. The difference between then and now is that in the mid-’90s you were going against the grain and against the momentum of society. Today, however, public opinion has caught up with that conclusion. Over the past 10 years, in particular, millions of people have left the Democratic and Republican parties. The number of independents is now up to 45% — while only 27% of Americans affiliate with the Democratic and Republican parties. The other thing you are seeing is that the number of people who are calling for a major third party has increased dramatically. It is now at 61%, according to a recent Gallup poll. There’s a real disaffection with the two establishment parties. Conditions exist today to create what so many unions tried to create in 1996 with the Labor Party. In terms of what is our transition plan, I think that labor-community coalitions and candidates are a very powerful way of getting there, and they are necessary. It will take a collaboration between labor unions and social movements to achieve a major working class party at this point. And we in the Movement for a People’s Party are the social component of that effort. I agree that working on a local level to elect candidates as part of local labor- community coalitions is a good way to begin because, yes, it doesn’t require as many resources at first — and victories on a local scale can help build the momentum for a major working-class party. Also, by the way, the name People’s Party is not the final name that we’ve decided upon. It’s a description. 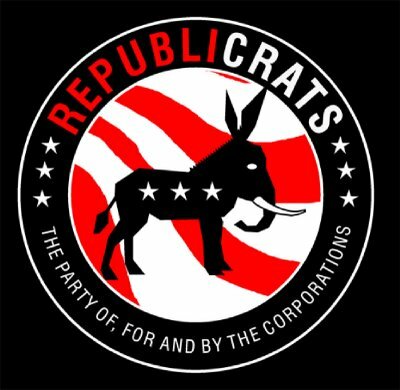 It says that the new party must belong to the people, as opposed to the Democrats or Republicans, which belong to the corporations. To move toward the formation of a mass working-class party, moreover, will require replacing one of the two establishment parties. When you get to the point where so few people belong to those two parties, the system becomes unstable and there’s an opening for a political realignment. And that’s what we have today. A.B. : One last question concerning the very concept of “independent.” We in The Organizer believe that “independent” must mean a clean break with the Democrats and Republicans. It must mean rejecting the “inside-outside” strategy promoted by all too many forces on the U.S. left. In our view, this approach has always derailed efforts to build independent working-class political parties in our country. Some today, such as Jacobin magazine, which is linked to the Democratic Socialists of America, are promoting what they call a “dirty break” — which, in our opinion, is no break at all. So how do we ensure that the candidates we are supporting are consistently independent? N.B. : Our mission as Movement for a People’s Party is a clean break. We have no interest in trying to rehabilitate the Democratic Party. The sooner we can get away from the Democratic Party, the sooner we can create a realignment in the country and create a new and different party for working people. A.B. : Before we conclude, is there anything else you would like to add? N.B. : I would like to say that we’re in the midst of a sea-shift in consciousness toward independent politics. Polls have shown that two-thirds of the people are not planning to vote in the mid-term elections. The reason they cite is that the Democrats and Republicans are hopelessly corrupt. The Political Revolution is where we declare our independence from the corporate parties, not just their candidates, but the parties as such. I encourage people to join us in the Movement for a People’s Party. We have organizers in almost every state, with chapters in many states. Our website is http://www.forapeoplesparty.org. 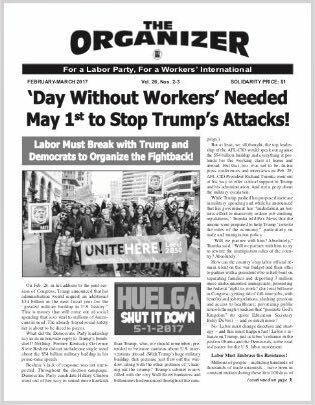 Over the past several months, The Organizer newspaper — through its Unity & Independence open-forum section — has been promoting a two- pronged campaign to advance the struggle to build a new mass labor- based political party in this country. 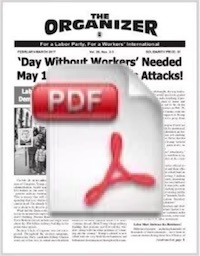 The campaign calls for the formation of (1) a Labor-Party Advocates-type committee in the labor movement (taking its cue from the October 2017 resolution of the AFL- CIO on independent politics), and (2) committees (or coalitions) in cities across the country to run independent labor-community candidates around a platform that embraces the workers’ and oppressed communities’ pressing demands. Bolstered by the formation earlier this year of a new political formation advocating for independent working class politics — the Movement for a People’s Party (MPP) — we believe that now is the time to take these next steps toward this objective. In this issue of Unity & Independence, we publish an interview with MPP National Coordinator Nick Brana, on why — despite efforts toward this end by “progressive” Democrats like Alexandria Ocasio-Cortez in New York — the Democratic Party cannot be reformed or otherwise used to advance workers’ interests. As past national political outreach coordinator of the Bernie Sanders for President campaign, Brana is well versed in all the inner workings of the Democratic Party that make it impossible for “progressives” to take over the Democratic Party. Bernie “progressive” wing and the Democratic National Committee (DNC) “moderates.” What is the real story here; what does this challenge inside the Democratic Party represent? Nick Brana: Progressives are making a genuine effort inside the Democratic Party, as they have for many decades, in an attempt to take over and remake that party. But these efforts are following the same trajectory that they have in the past. For more than 100 years, the Democratic Party has refined a model to suppress progressives and block their efforts to take over the party. It goes like this: You block their efforts in the primaries, and then, for the scattered few who make it through, the party machine goes to work to reel them further and further into the establishment, which in turn will de-radicalize them. There is a striking divide between the hype that has gone into reporting on progressive victories and the actual statistics behind it. You will notice, for example, that the various articles that are celebrating Alexandria Ocasio-Cortez’s victory don’t mention that she is the only progressive to have unseated a Congressional incumbent in the 2018 midterms. That’s a striking figure. Nearly all the incumbent corporate Democrats are going to go right back to Congress next year. We in the Movement for a People’s Party (MPP) have been analyzing how progressives are doing in the Democratic primaries. We totaled up the Congressional endorsements that the leading progressive groups have made (Our Revolution, Justice Democrats, Brand New Congress, and DSA). And what we found is that there have been 21 Congressional progressive primary winners, but of those 21 the overwhelming majority have been in deep-red districts. These are double-digit Republican districts where the Democrats face extremely well- entrenched incumbents. They are districts where the Democratic Party establishment didn’t even contest the progressives who were running, because the DNC and the DCCC have written off those districts as so heavily Republican that it is not even worth challenging those seats. The majority of progressive primary wins have been there. When we looked at the primary victories that had actually been in blue districts, where the nominees have a good chance of winning, we found only four progressives who are likely to go to Congress. And when we broke it down even further, we found that two of the four progressives who won are incumbents that the Democratic Party establishment is not trying to unseat — representatives Jamie Raskin and Ro Khanna. Another winner, Chuy García, got his seat by making a corrupt deal with two machine Democrats in Illinois, Chicago Mayor Rahm Emanuel and State House Speaker Mike Madigan. Garcia was also uncontested by the party establishment. And the only remaining one, the only new progressive heading to Congress, is Alexandria Ocasio-Cortez. The Organizer: You talk about the establishment’s goal of blocking “progressives.” The DNC adopted a resolution that lets them block Bernie Sanders from running for president in 2020 as a Democrat. Can you explain what this is about? Nick Brana: This goes back to the 2017 DNC fall meeting, where DNC Chair Tom Perez appointed zero progressives to the very important Rules and Bylaws Committee, which is in charge of making the rules for the 2020 presidential race and for the rest of the elections. The committee was stacked with corporate lobbyists, consultants, and people like Donna Brazile (who outrageously helped to rig the 2016 presidential election). These were the people left in charge of deciding the rules in 2020. This past June the committee decided to pass a new rule stipulating that to be a candidate for president on the Democratic Party line, your writings, your public statements, and your actions have to demonstrate that you have been a “faithful” Democrat throughout your career. This is an elastic clause that gives Tom Perez and the DNC the power to decide who gets to run on the Democratic Party line for president, and who doesn’t. The DNC can essentially veto progressives from running on the Democratic ticket. If the party’s corporate donors demand that Bernie be blocked from running, Perez and the DNC will dutifully oblige. The Organizer: One story that has gotten a lot of play in the media concerns the superdelegates — the provision that gives the DNC an overwhelming majority at the Democratic Party national conventions. According to the reports, the power of the superdelegates was recently curtailed, allegedly under pressure from the “progressives.” This is being presented as proof that the Democratic Party can be reformed and taken over. What is the reality behind this change, if any, to the superdelegates provision? Nick Brana: The rule that the DNC is pushing regarding the superdelegates is one that says they won’t be able to vote until the second ballot; they just won’t be able to vote on the first ballot. This is a way to make it appear that progressives have succeeded in nullifying superdelegates. But if the DNC really wanted to do that, it could just get rid of them. But they’re not doing that. Instead, they are keeping them in such a way that retains their ability to suppress progressives. The superdelegates were created in the first place as an elite check on the rule of the people; if the people ever made the wrong choice by attempting to elect a progressive like Bernie Sanders, then the superdelegates would be there to veto them. In 1944, Henry Wallace had the support of Eleanor Roosevelt and Franklin Delano Roosevelt for his vice presidential nomination — and he won resoundingly on the first ballot at the national convention. The party leadership quickly adjourned the convention (because they controlled the rules), prevented the vote from becoming official, and then came back the next day and held a second vote on the second round. They ensured, by making all sorts of deals, that Henry Wallace would lose his vice presidential nomination, and Harry Truman would then win. Harry Truman went on to become Roosevelt’s vice president and then president of the United States. So the Democratic Party has the power to force proceedings to a second ballot to activate the superdelegates, as a veto on any progressive who could come uncomfortably close to challenging the party establishment. And that veto power has not been removed; it has just been transferred to the second ballot. The Organizer: The Democratic Party establishment is proclaiming that the reason Hillary Clinton lost the election was Russian meddling in the election: Russiagate. In our view, this is simply a refusal to acknowledge the failures of the Clinton campaign, beginning with its pro-Wall Street and anti-worker agenda, in the election. Any thoughts on what this Russiagate is all about? Nick Brana: What is ludicrous about this is the fact that in the United States in 2016 there was a political party that participated in rigging an American presidential election — and it wasn’t the Republican Party; it was the Democratic Party, when it rigged the primary against Bernie Sanders. The evidence is out in the open thanks to Wikileaks. The email exchanges are out in the open. The fundraising contracts are out in the open. It has been admitted to by numerous party figures. Debbie Wasserman Schultz was actually fired from her job as DNC chairwoman as a result of the rigging. DNC staffers were fired for this as well. It’s well understood that the Democratic Party orchestrated the rigging of an American election. For the past two years, however, the country has been treated to a Democratic- led hysteria, a new McCarthyism, with the Democratic Party essentially blaming the Republican Party for something that it itself is proven to have done. The Organizer: Given this situation, what are you and the Movement for a People’s Party saying needs to be done in the coming weeks and months to build a new mass party of working people? Nick Brana: We believe we need to come together as organized labor, as a progressive movement, as the Poor People’s campaign, as students, as immigrants, across civil society, to build the major new political party that two out of three Americans are now calling for. One of the areas where we can begin is to run labor-community candidates in particular cities, hopefully in 2019. We need to promote a slate of labor- community candidates, as there are new fissures developing within the labor movement, in particular, in relation to the Democrats, seeing as how the unions have been devastated over decades by the Democrats. Those fissures are finally creating the opportunity to build a major new party. To help establish the roots of an alternative political party we need to push for a new Labor Party Advocates that brings together the many unions and labor organizers who are starting to break with the two establishment parties. The Organizer: Is there anything you would like to add? Nick Brana: Yes. One of the things that’s really important to understand — and that has gotten completely lost on those who are aiming to reform the Democratic Party — is the unfortunate perception that once you elect progressives through the Democratic Party, those individuals will remain faithful to their campaign platforms. The idea then follows that you will just keep on adding on more progressive colleagues in the next election, and so on. Well, that is not true whatsoever. It ignores the historical fact that once they win, the few progressives enter a machine that consistently, almost without fail, reels them into the establishment. The few that make it through must show deference to corporate party leaders to receive desired legislative committee assignments, and party support for legislation and campaigns. And they must moderate their critique of the party, too, and support conservative Democrats in swing districts. They must also trade votes and favors with neoliberal committee heads to get their legislation heard. They must secure the blessings of the establishment, too, to avoid well-funded primary challenges and to keep their jobs and their income. And they have to toe the party line to move to higher office and advance their careers. Every structural incentive inside the Democratic Party works to make incumbents more conservative. that you elected two years ago are in the process of becoming part of the party establishment. One of the best examples is Bernie Sanders, unfortunately. He said that the political revolution was about electing progressives. But out of all of the corporate Democrats running for Congress, Senate, and governor this year, Bernie has only endorsed against a single incumbent: Rep. Dan Lipinski in Illinois. He endorsed Marie Newman. He has also supported establishment Democrats running for the Senate. This is because Bernie wants to get along with establishment Democrats in Congress in an effort to win their support for his policies. So it leads even someone like him not to challenge the re-election of conservative members of Congress. Progressive have been elected here and there to the Democratic Party for decades, but they have never managed to change the direction of the party or the country. The party always changes them. I would like to add one final point: With the Democratic Party, you cannot hold onto the progress that working people make through mass struggles — with the huge strikes of the 1930s, and through independent party pressure from Norman Thomas and the Socialist Party, or the Progressive and the Populist parties of the early 20th century. These struggles forced the progressive issues to the forefront and compelled Roosevelt and the Democratic Party to accept them. That is how we won the New Deal, banking regulations, labor rights, a social safety net, and a 40-hour workweek. But when you’re contending with just the Democrats and Republicans, working people in this country cannot hold on to the progress they fought hard to achieve. We can’t build upon the victories of past generations because these two parties are constantly undoing the progress that millions managed to win through blood, sweat and tears. Rather than building upon our achievements, we’re stuck fighting to defend them as they are dismantled. That is the dynamic that we have to change with a major new party of working people. The Organizer: From our perspective as The Organizer newspaper, what we are witnessing is the deepening crisis of capitalism, a system in its death agony. It is also a crisis of the two mainstream political parties that have been beholden to this system. It’s this crisis that is compelling the twin parties of capitalism to roll back all the gains — social safety net, voting rights, labor rights, civil rights, immigrant rights, banking and environmental regulations, etc. — that workers and the oppressed have won through bitter struggles over the past 80 years. Nick Brana: Absolutely. And that is why the Democratic Party and the corporate media are jointly focusing on anecdotes of progressive victories in the Democratic Party, rather than on statistics, in an attempt to make it appear that Democratic Party is reformable and that a sweeping wave of progressives is coming in, when, in fact, the media is spotlighting the exception to the rule, not the rule itself.